rec. February, April, September 2004, Uranienborg Church, Oslo, Norway. First it was the Grechaninov Passion Week (see review) and now here’s another fine disc of unaccompanied singing, this time from Norway. The Russian disc showcased the considerable talents of two American choirs – not to mention the sonic benefits of Super Audio – while the Nystedt is a home-grown product, featuring Norwegian forces in contemporary music from their homeland. The recording is also a hybrid SACD, so I was curious to hear how 2L’s approach compared with that of the Chandos team in the Grechaninov. Given that the latter is something of a benchmark in a cappella singing and recording the Nystedt would have to be very special indeed. Granted, the musical idioms are very different, Russian Orthodox Church music – rich, fervent, dark-toned – as against a plainer, brighter modern idiom with its roots in Palestrina and Bach. Nystedt grew up in a Christian household, so hymns and church music are the cornerstones of his music. He has played a vital part in Norway’s musical life as well, founding no less than two first-rate choirs – Det Norske Solistkor and Schola Cantorum. What better, then, to have this music performed by two equally fine choirs, Ensemble 96 and Bærum Vokalensemble, the former created after the Oslo Philharmonic chamber choir was disbanded in 1996 and the latter an all-female group once led by Øystein Fevang. According to the Ensemble 96 website this CD was nominated for two Grammy Awards in 2007, so expectations were high. The first piece on the disc is a setting of texts culled from the writings of the 19th -century Danish philosopher Søren Kierkegaard (1813-1855). Not surprisingly the writing has something of the philosopher’s style about them, direct and shorn of distracting verbiage. The music is a mirror of that, closely focused and unsentimental. That said there is plenty of human warmth when it’s required – the plainchant-like opening and the end of first prayer – allied to singing of great virtuosity - the animated second prayer. Despite singing of real intensity there are many moments of inwardness and repose as well. For instance in the third of the prayers there is a wonderful, restrained interplay of voices that is most affecting, the prayer ending with a lone soprano rising gently from the chorus. A lovely touch, this. Nystedt creates some thrilling juxtapositions – the men and women in the fourth prayer, the women’s repeated figures in the fifth prayer – and in the final prayer ‘Father in Heaven! You loved us first!’ there is a palpable sense of joy, tempered towards the end with humility. All the while the choir sings with great crispness and feeling, the detailed recording picking up all the nuances within. And for once there is not much to choose between the ‘Red Book’ CD layer and the SACD one, as both are very involving and atmospheric. The Salve Regina strikes a warmer, more devotional note, with some gorgeous, resonant singing from the men. There is also the sense of a large – but not too reverberant – acoustic, which suits this music admirably. The final bars are glowingly beautiful, making it one of the most moving settings of this old text I have ever heard. One of the more substantial works is The Word Became Flesh, a setting of John I, 1-14 (‘In the beginning was the Word, and the Word was with God’). The voices build from a hushed opening to some splendidly incisive, ecstatic moments – just listen to those stratospheric soprano lines – and at 2:34 and 5:41 the writing is rich-toned, almost orchestral in timbre and weight. Simple but very moving. 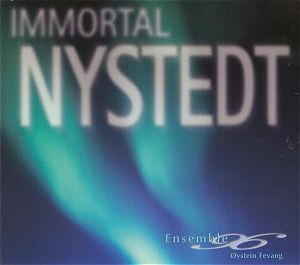 Nytt er livet was commissioned in 2003 by the Bærum Vokalensemble, who gave its first performance in September that year. It is based on texts by ne Olav Mosdøl (b. 1937) and was inspired by the baptism of the writer’s first grandchild in 1987. The first line, ‘New is the life that grabs hold of the light’ is a sure pointer to the work’s sentiments. The women’s voices proclaim this new beginning in music of great vigour and rhythmic vitality (first part), while in the second the soloist and chorus engage in a rapt but tender dialogue, as if between mother and child. Part three ‘Glorious is life with its great opportunity’ is more subdued, tinged with wonder; in part four there is joy but also, at the close, awareness that ‘hardship’ is an inevitable, necessary, part of life too. Nytt er livet has a disarming simplicity, charming without being mawkish. Jesu sieben Worte is at the other extreme, as Christ awaits death on the cross. Written for Ensemble96, who premiered the work in September 2003, this piece has a darkness, a gravitas, not heard before. The men manage some lovely quiet singing, most notably at the close, the women adding bright coronas of sound in parts. It is a lovely piece but perhaps not as memorable or moving as, say, the Salve Regina. The final item on the disc is a reworking of J.S Bach’s Komm, süsser Tod (‘Come, sweet death’). The chorus is split into five equal groups spread around the church, a spatial effect that is probably best appreciated in surround sound. This arrangement is not obvious in vanilla stereo but, goodness, there are some astonishingly long, sustained choral passages that must require phenomenal breath control. The organ-like sonorities that result are most impressive and a reminder, if it were needed, that this is a choir of considerable talent. I nominated Passion Week as one of my discs of the year and I have to say the Nystedt will be high on my list as well. Not perhaps as totally absorbing and emotionally charged as the Grechaninov but no one can deny it is choral writing of rare beauty and intensity. The booklet isn’t terribly informative and, a minor caveat, I don’t much care for the fact that it’s attached to the gatefold box – very awkward. But that really is the tiniest of quibbles; otherwise this is a wonderful collection and one that I hope to revisit again and again, with undiminished pleasure.